JoLon Imp Johannesburg Homecoming party. To mark the triumphant return of the now famous JoLon Imp, a FULL CIRCLE CHARITY DINNER & AUCTION is being organised at the Randburg restaurant Scrooge Diner on Friday 26th September. who last year organised a trip similar to that of the Imp duo’s journey but Chris and friends were astride simple scooters!!! Sadly Chris contracted a deadly virus and although he narrowly escaped death he was bedridden as a result of the illness and has also suffered complete blindness. So feel free go join us for the event and if you would care to donate an item or three of interest that we could auction for his benefit please contact me to arrange. a very emotional time and exciting at the same time to know that my old faithful will soon be re-united with us here in South Africa. 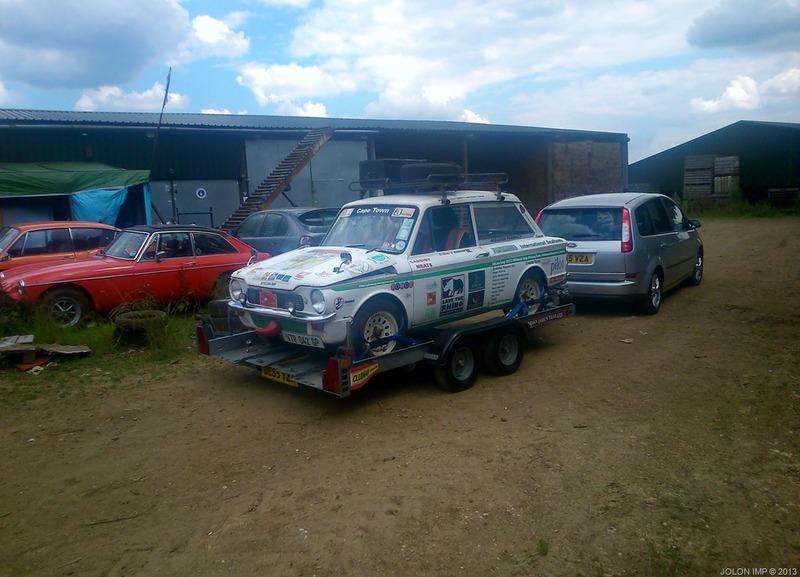 the following is a mial from james Spencer in the UK who was the driving force behind getting the Imp seaborne and on its way home. Thanks James! the following is a very happy mail i received from him a few short hours ago. Good to talk to you this morning and I can now report that The JoLon Imp has been safely delivered to Wallenius Wilhelmsen Logistics at Southampton and will be shipped on Saturday 5th July. I left the car in a parking area amongst many new Jaguar, Range Rover and Rolls Royce, so it is in good company. I attach a photo of it as I left and one of it leaving Nick Harrisons store in Banbury. I am pleased to have been able to help in the return of your wonderful little car to its homeland, what is the saying, OLD IMPS NEVER DIE THEY JUST GET FASTER. Please let me know when the car is safely returned to you. I am sure we will speak again. 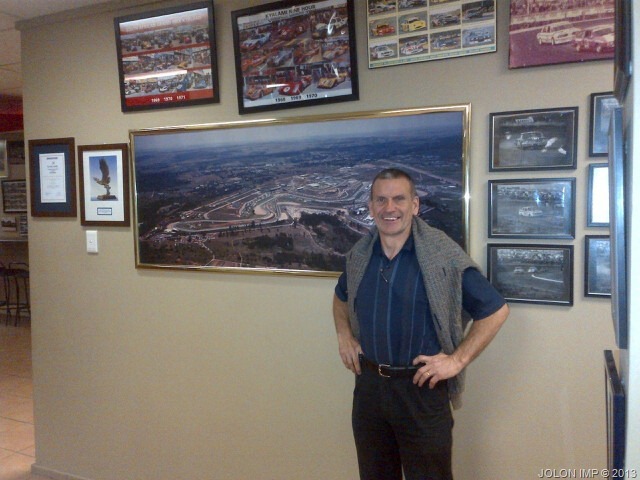 Terence posing next to a picture of the Kyalami Race Track in Midrand, less than a month before the track and associated properties goes on public auction. 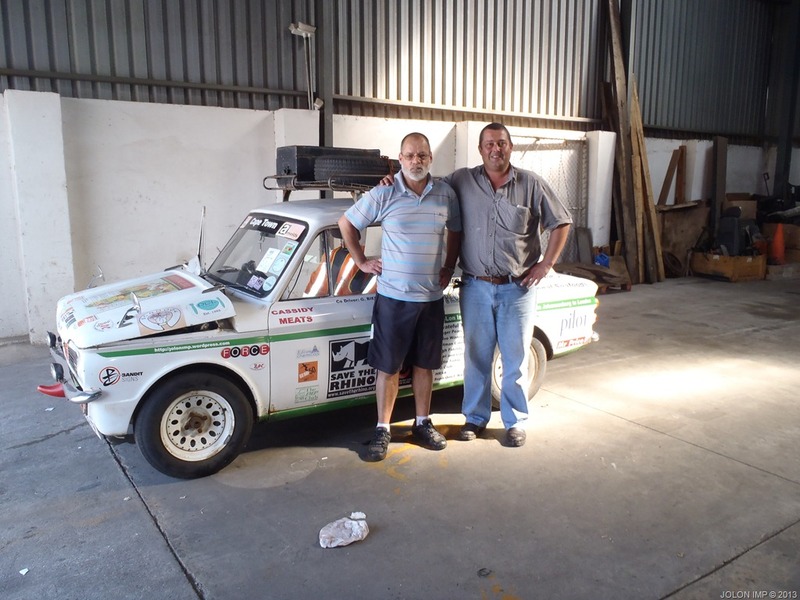 The occasion was the presentation of the JoLon Imp story to the Kyalami Marshal’s Association. Seems like the shippers that are returning the JoLon Imp to South Africa are refusing to allow it to travel with all our personal effects!!! 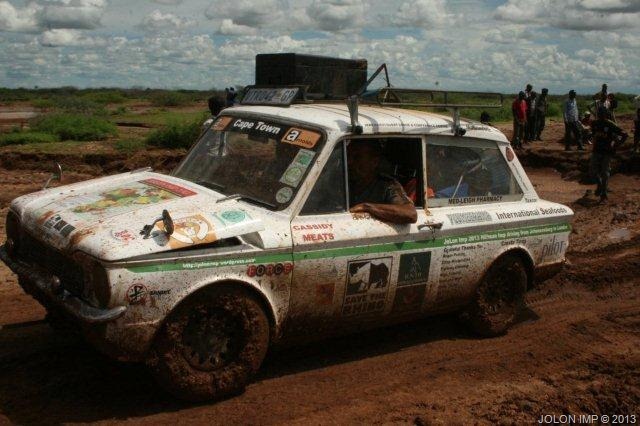 I was so looking forward to letting the folk back here in South Africa see the car as it arrived in the UK with its camping gear loaded on the roof, tools trammel on the roof rack and of course the well used spade strapped to the side of the roof rack, the spade that dug us so often out of the mud on the north Kenyan mud hell. I was also so looking forward to sitting back in our camping chairs that we had used in my garage all through the JoLon rebuild and it would also be nice if we could cook up a meal in our camping pots n pans again for old time sake. Sadly the red tape wins again. Seems like getting the car back to base to prepare it for its next transcontinental journey is proving to be our most arduous task so far. A big thank you to all those of you involved in looking after my little car while still in the UK, James Spencer and Graham Anderson especially. Some administrative hiccoughs have delayed the return of the Imp but with a bit of luck it will be brought to Port Elizabeth next month. From there I will drive it to Cape Town and then on up to Joburg. My manuscript of the journey’s story that i have written since my return from Coventry is almost ready to be presented to prospective publishers, so if anyone who reads this knows of a publisher that might have a leaning to publishing a story such as this one, please contact me chop chop. I have prepared the following missive ready to launch onto the desk of any such publisher so I would be grateful if any of you could pass this along if indeed you might have a connection in this realm. 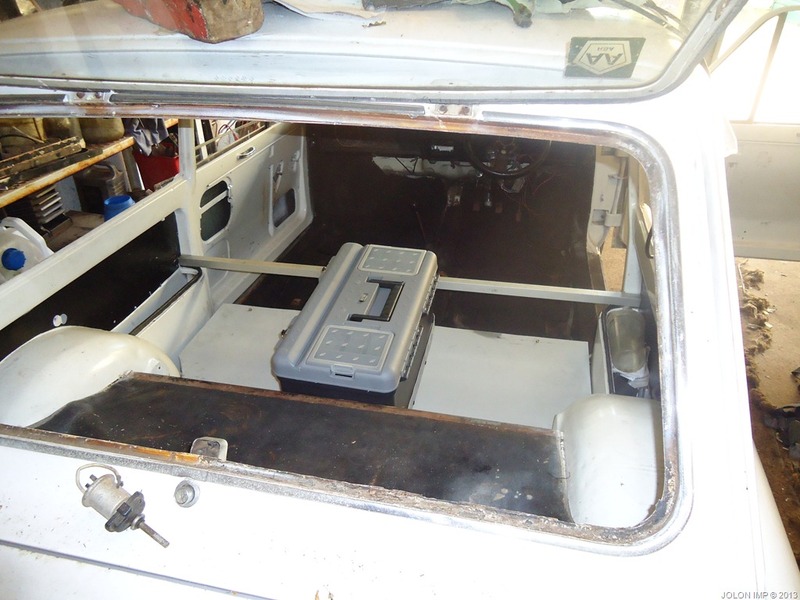 In May last year the Hillman Imp, one of Britain’s most unreliable small cars turned the half century mark and to celebrate it golden birthday I decided to throw caution to the wind and attempt to achieve the impossible dream, to drive a Hillman Imp from Johannesburg to the big Imp party in Coventry, England where its engine emanated from. The challenges that needed to be overcome were monstrous and all but a handful of our friends believed we would make it and many of our enemies hoped we wouldn’t. Well we did make it and this epic Imp trip has produced meaningful interest across the globe. 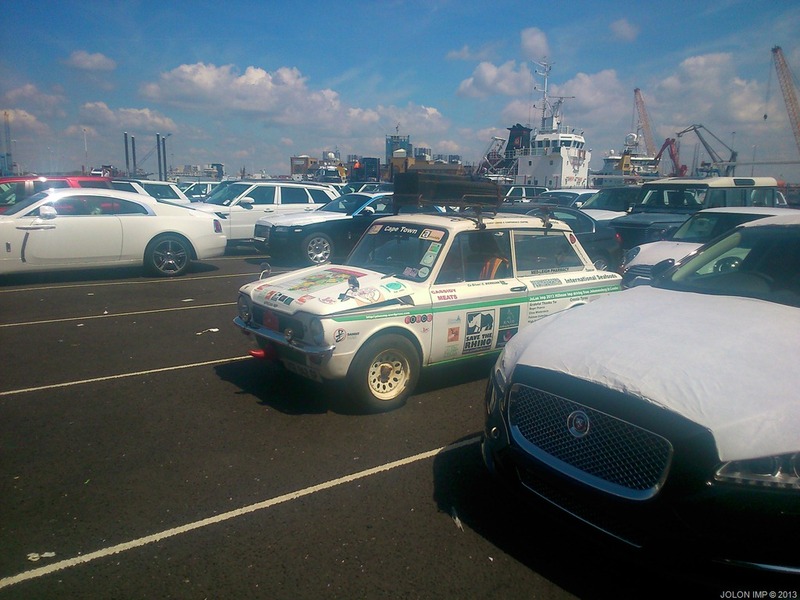 With the voyage completed the story ended not; the car became the centre of attention as we drove it across the length and breadth of the UK and Ireland meeting with celebrities at every turn. Public votes placed our Imp as finalist in the prestigious Classic Car Of The Year competition in November and it was the highlight of the Lancaster Insurance Car Of The Year stand at the 2013 National Exhibition Centre in Birmingham. Since our return we have had regular radio interviews and TV talk show invites. Our story has been carried by numerous newspapers and motoring journals. (The list of these publications is attached.) Over and above all this exposure, our Blog www.jolonimp.wordpress.com and the Imp Forum http://forum.theimpclub.co.uk/ have jointly generated upwards of 25, 000 hits. The trip was such a mammoth undertaking more especially since we set off with zero back-up and neither of us experienced travellers nor mechanics it was unavoidable that I would reduce the memories to print so that more than just Geoff and I could get to enjoy the thoroughly gripping adventure. I have up until now compiled over 80, 000 words and I expect the complete story would range between 85, 000 and 90, 000 words with end of March my target for completion of the first draft of the manuscript. Many of my friends has insisted that they will certainly purchase the book once it is published and I am convinced most of the imp club members will buy at least one copy not to mention members of other car clubs such as the Historic Racing South Africa and the MG club of Johannesburg and many more such groups. 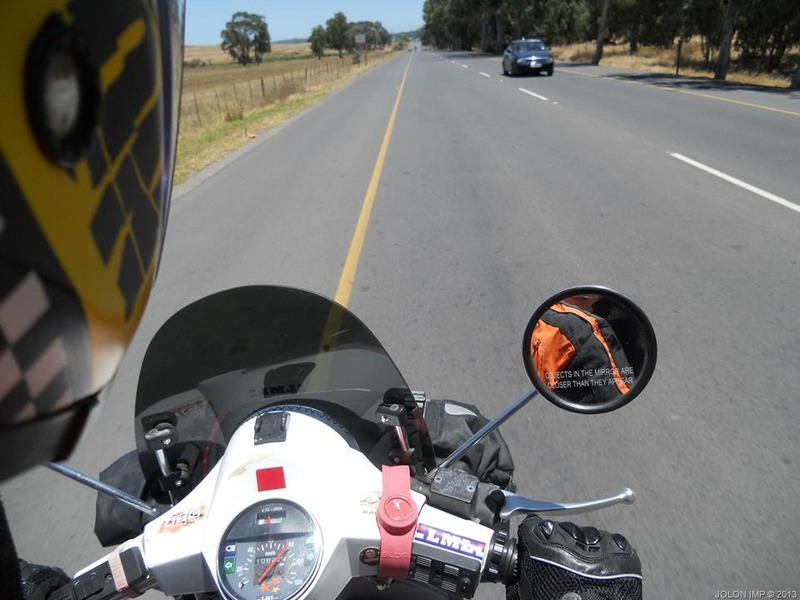 Along with the rich verbal tapestry of our transcontinental mission we have a massive collection of photos of the trip’s trials and tribulations that would add handsomely to the tale. I now need the help of your company to allow me to bring this great story to market. Kindly give very serious consideration to my proposal that you are here presented with and I firmly believe we will both be richly rewarded. The JoLon Imp patiently waiting for spares from the Austrian Imp Club member Peter Rosenzweig who helped us to make the final stretch to Coventry by May 6th last year on the very last day of Imp celebrations. 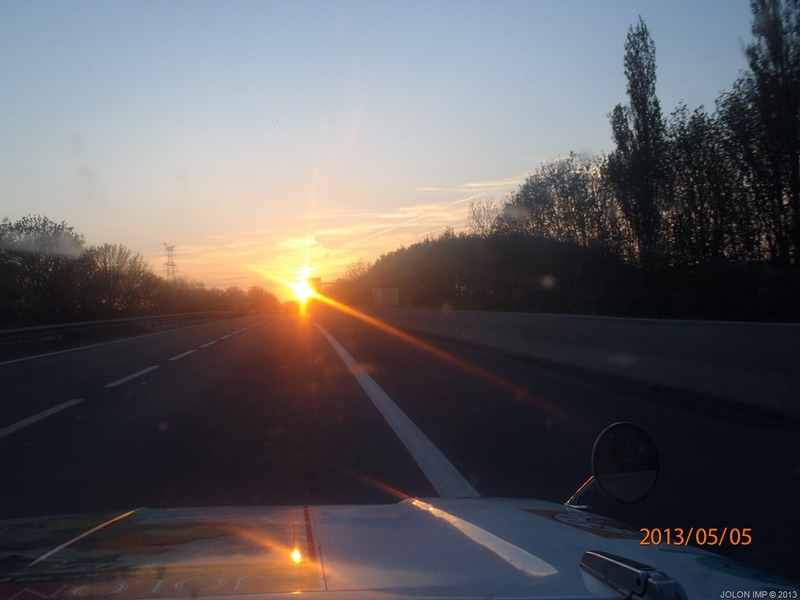 As the impatient clock tick-tocked its way into the first minutes of the final day of Imp 50, Geoff and I were driving hard towards the Calais ferry port in a bid to cross the Channel to complete our final journey’s leg. We drove hard and prayed even harder that we would make it. We had had more than our fair share of delays so we expected our luck to turn favourable. It did! Not only did we manage to board an England bound ferry but once the ship’s crew learned of our trip they offered us access to the staff quarters for us to have stunning hot showers (we not only really wanted these showers…. we NEEEDED them!). we were also treated to the privacy of a very posh lounge that was closed to the public where we slept like the dead for the remainder of the short trip across the water to Dover. sunset as we aimed our JoLon Imp towards the ferry port of Calais. 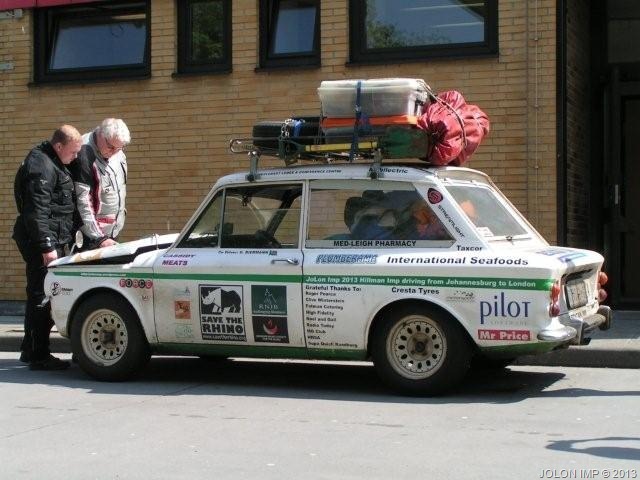 Website for Olly Rowland and Frank Claydon's corageous drive in a Hillman Imp from England to Mongolia.